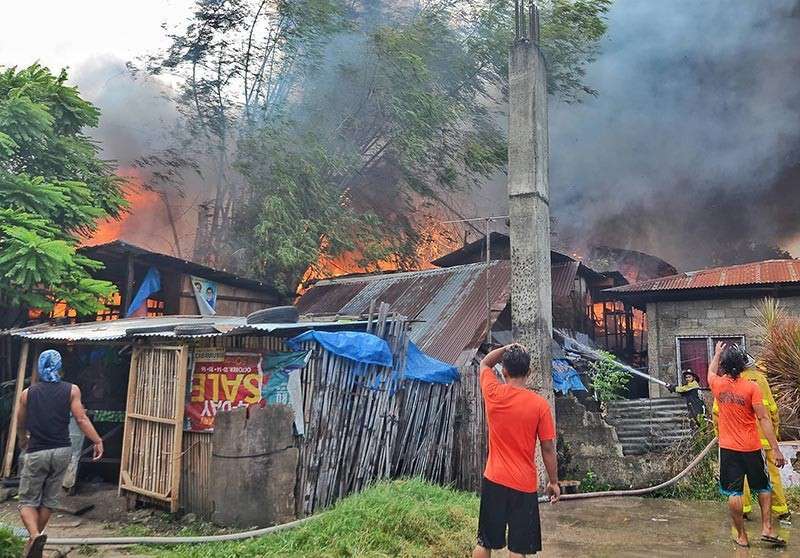 THREE persons were injured while 377 individuals were affected by the fire that struck Sitio Tabucanal, Barangay Poblacion Pardo, Cebu City on Sunday morning, Feb. 3. Poblacion Pardo Barangay Captain Manolita “Litang” Abarquez said the fire razed 85 houses and damaged 11 others. In a separate estimate, Cebu City Fire Department Chief Noel Nelson Ababon said 50 houses were destroyed. The alarm was received at 8:59 a.m.
Ababon pegged the damage to properties at P1.2 million. The Poblacion Pardo Barangay Council will allocate P400,000 of its calamity fund to feed 96 families displaced by the fire. On Monday, Feb. 4, the council will declare a state of calamity. Rushed to the intensive care unit of the Cebu City Medical Center was Christian Jade Solonia, 18, who suffered burns after he returned to his home to retrieve his cellular phone. Solonia’s cousin Renedith, 20, also suffered burns. A volunteer pulled Renedith to safety. Their neighbor Mario Tabura also suffered burns in his arms and face. The fire reportedly started in Tabura’s house. At 9:02 a.m., the fire was raised to second alarm after flames spread to other houses. Thirteen minutes later, the fire was raised to third alarm. Firefighters had the flames under control at 10:09 a.m. The fire was completely put out at 1:44 p.m.
Ababon said they were still investigating what caused the fire. Abarquez said she was told a butane canister exploded in Tabura’s house while someone was cooking. Survivors were taken to the barangay gym beside the Pardo National High School. Social workers will provide them with food for three days. Ababon admitted they had difficulty putting out the flames because the fire was in the interior portion of the sitio, which had narrow roads. Firefighters had to connect 20 hoses to reach the fire scene. Ababon said the area should be reblocked and the roads widened. At 1:50 p.m., fire broke out in Sitios Galaxy and Rattan in Barangay Tangke, Talisay City, razing 60 houses. According to Señor Insp. Ara Alfajaro of the Talisay City Fire Station, the fire alarm was raised to Task Force Bravo at 2:32 p.m. to secure the assistance of fire stations in neighboring areas. The fire was declared under control at 3:16 p.m. and was declared fire out at 4:10 p.m.
“We didn’t realize the flames had grown so big when we arrived, so we had a hard time at first, especially with the strong wind that was fanning the flames. But we were able to penetrate the scene eventually. Also, help arrived from the Minglanilla Fire Station, Cebu City, Mandau, Lapu-Lapu (fire rescue units) and the Chinese Volunteer (Cebu Filipino-Chinese Volunteer Fire Brigade),” Alfajaro said in Cebuano. She added that Tangke was a fire-prone barangay. “We plan to reblock the area. The houses here are close to each other. That was why it was identified as prone to fires. Also, most of the houses were made of light materials,” she said in Cebuano. As of press time, authorities were still investigating the cause of the fire and the total cost of the damage. Kylle Dabasol, 20, said the fire started in an abandoned house owned by a certain Nerrisa Bacalso. “Nobody lives there so people come and go. A child was reportedly playing with a match inside. When the fire started, he ran. The house was full of fishnets, dirty laundry and plastic bottles,” he said in Cebuano. Judith Campaña, 47, was grateful her family emerged unscathed even though they lost all the chickens they were raising. Tangke Barangay Captain Nelson Cabanes said the survivors were temporarily evacuated to the Tangke Elementary School.